The victim and gunman in last week's shooting on Virginia Tech's campus have been identified, but there's still no clear indication of why the attack occurred. The victim was 39-year-old police officer Deriek Crouse, an Iraq war veteran and beloved father of five children and stepchildren. 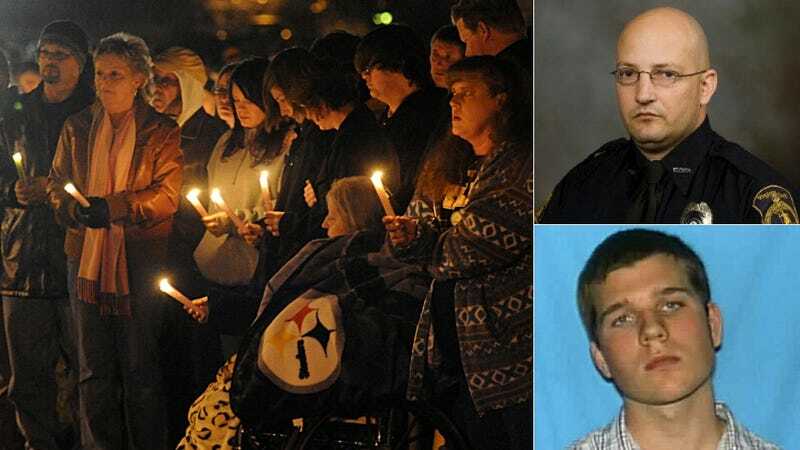 He didn't know Ross Truett Ashley, a 22-year-old part-time student at Radford University, who by most accounts was an average college student no one expected to turn violent. Crouse's funeral will be held tomorrow afternoon, and in the days since Thursday's shooting the Virginia Tech community has pulled together to remember him and raise more than $56,000 to help his family. The Roanoke Times' profile of Crouse is a pretty devastating read. He and his wife Tina Crouse were friends in high school who reconnected while he was serving in Iraq, and got married after he returned. Together they had five children between the ages of 9 and 18, with one boy from his previous marriage and four boys from hers. About an hour and a half before the shooting they had texted to say "I love you" to each other, and Tina says that after she heard the news, "My first thought was, ‘I wish I had kissed him better that morning.'" Of course, the entire family is devastated, but Tina says that while she initially wanted revenge on the shooter, she's changed her mind. "I wanted somebody to hate," she said. "But I've seen it, and it's just some stupid kid. I got no satisfaction from that." Many people are looking to make sense of what happened, but none of the information released about Ashley gives any indication of why he committed the crime. Police say that on Wednesday Ashley walked into his landlord's office wielding a gun and demanded the keys to an employee's Mercedes SUV. The car was found near the Virginia Tech campus after Ashley shot Crouse while he was conducting a traffic stop, then killed himself about an hour later. "We all have our family problems, so the way that he was saying it just made it kind of seem like, 'just another thing to add to the list ... He never made anything sound like, 'This is serious, I need you to sit down.'" His best friend added, "[I] didn't see this coming," and "I don't think Ross is the kind of person to do this without some kind of reason." Yet, an acquaintance said he was afraid of Ashley and, "There was a dark side about him that was very disturbing." Even if most people only knew Ashley to be a regular college student, that doesn't necessarily mean he was well, just that he kept his problems to himself. It's natural to want to know what motivated the attack, but no matter what was going on in Ashley's head, the shooting is still just a senseless tragedy.